The central column rose and fell one more time as the TARDIS came to a full and materialised stop on terra firma cognita. "So…" Rose said, "Where are we this time?" "Earth, 2012," The Doctor answered her. "That's only seven years after I left. What are we going to do? Check to see if Arsenal are still the top of the Premiership." "No point. Everyone knows Burnley were Champions five years in a row." "You have to be joking." "Yes. Sometimes. Anyway, I guess I don't have to change? Jeans are still in fashion?" The doctor flashed her the sort of smile that set her heart beating a pace faster than usual every time and reached out his hand to hers. "Why are we here then?" She asked as they stepped out of the TARDIS into a dull, grey, sullen morning in North London. "Checking something out. I saw it in the databanks and it didn't ring true. I think there might have been a fracture in the time continuum." "I think an alternate reality has come into existence, almost identical to the one we knew, but with some small, subtle change that might or might not be cataclysmic." "Well, things don't look cataclysmic." They had turned into a familiar street. Ahead were the tower blocks that had been home to Rose for all her life before she joined The Doctor. Nothing seemed to have changed. It would take a HUGE cataclysm to change those flats. "Let's go see mum. SHE would know if anything cataclysmic had happened." "Only if it happened to Top Shop." The Doctor said. Rose threw him a disgusted look but she knew him well enough. He cared about her family as much as she did. He just didn't DO domestic. When they reached the entrance to the flats, they saw something was happening. Maybe not a cataclysmic happening, but one to bring almost everyone in the tower block to their window for a good view. There was an ambulance with lights flashing and a police car, too. The paramedics were wearing face masks. So were the police and anyone not masked was being held back by them. "Mickey…." Rose called to the most familiar face in the crowd. Mickey Smith turned and she stopped dead, startled by his look. It wasn't that he was seven years older than when she had seen him last - because the differences were only small. But he looked tired, strained and scared beyond even his usual mild cowardice. "Rose… of all the moments for you to turn up…" he glanced at The Doctor. "And you… I'm almost glad to see you. Rose… you have to… it's your mum…." He grabbed her by the arm and pulled her towards the nearest police officer. "She has to come through. It's her mum…" The police officer looked at her and at Mickey. "Ok, she can go in the ambulance but she has to wear a mask." And he gave her a plastic face mask such as the rest of the emergency personnel were wearing and took her by the arm. "This is going to be a shock…" he began, but just then more paramedics appeared at the door to the flats, with a stretcher. Rose knew at once. She ran to her mother's side. She blanched when she saw her. She looked twenty years older, her face lined and her skin sallow, her eyes sunken in the sockets. "Mum… oh mum… what's happened?" "Best if she doesn't try to talk till they have her stabilised," the paramedic said kindly. "Come on, they'll look after her at the hospital." Rose looked at her mother on the stretcher then turned to The Doctor, standing next to Mickey. The Doctor tried to come to her, but the police forced him back. She saw Mickey put a hand on his shoulder and point to a parked car nearby. The Doctor nodded and gestured to her to go in the ambulance. She understood. He would be right behind. The Doctor followed Mickey to the car. He was surprised. "Mickey the idiot driving an Audi? What happened to the beat up mini?" "Times have changed," Mickey said as he got into the driving seat. The Doctor climbed into the passenger side and glanced at the back seat where a child seat was fixed. "Mickey the idiot is a DAD?" "Times have changed," Mickey said again. "Don't tell Rose. She has enough on her plate with her mum. I don't want to dig up our old history at a time like this. Of all the people for it to get." "For what to get?" The Doctor asked. "What happened to her?" It seemed like ages before she was allowed into the isolation ward. Rose hardly seemed to see how many other beds there were, surrounded by bleeping monitors, with people looking as ill, or worse, than her mum was. She just saw the end bed, where Jackie Tyler had been "made comfortable." She walked down the ward in a daze, not quite taking in what she had been told, because it couldn't be right. It couldn't be. Her mum could not be dying. But the sight of her, with the mask over her mouth and nose to help her breathe, an intravenous drip into her arm and the beeping and blinking of the machines around her with numbers that Rose understood less than those on the TARDIS's console, told her the truth she didn't want to face. Her mum was dying. Rose gave a loud sob, despite herself. "Rose, sweetheart…" Her mum spoke with difficulty, and she bent nearer to listen to her. "I'm glad you're here. I don't know how he knew… but he got you to me." He DIDN'T know. Rose assumed she meant The Doctor. Jackie always called him 'he'- not by his name - not that The Doctor WAS his name. But it WAS just a coincidence. They WEREN'T here so that Rose could be with her mum in her last hours. They were here because of a fracture in the Time Continuum. And whatever that was, it was nothing to do with Jackie Tyler dying. Rose looked at her mum again. She seemed to have fallen asleep. Or…. Rose's heart sank for a moment. But the reassuring bleep of the life support monitor had not changed. The zigzag line that proved she was still alive snaked across the screen and the blood pressure monitor blinked its ever changing numbers. "Rose…." She felt a gentle pressure on her shoulder and looked up at The Doctor's face, softened in kind, gentle understanding where so often he could be hard, bitter, sarcastic, angry, even downright mean. "Come on, we have to go." "Its going to be all right," The Doctor said. "At least… I think it can be. We can try at least… to make this not happen. Rose… I helped you be with your dad when he died. I think I can help you NOT have to be with your mum…. But we need to get out of here." Rose looked up at him as he held out his hand to her. She looked back at her mum, asleep now. She wouldn't even know she had gone. "If… what you think you can do… doesn't work…. Bring me back in time... to be with her… so she doesn't know I left…"
"I promise," he said. And she got up and took his hand. With a backward glance at her mother she came with him. As they walked back down the ward she realised what she had not seen before. "ALL these people are dying? There must be thirty beds in the ward." "Yes," The Doctor said. "And three hundred more in this hospital, about one million people across Britain - a billion across the world. Two years ago, a new strain of cancer began to appear, a strain that was infectious by physical contact, like AIDS. People began dying in greater numbers than ever before. And then, two months ago, an airborne strain began to turn an epidemic into a plague." They were outside the hospital now. The Doctor took off his mask. "Useless anyway. If we were going to catch it we would have when we first stepped out of the TARDIS." Mickey was waiting by the Audi. "We have to go." He put his hand in his pocket and took out the TARDIS key. He pressed it and it began to glow. They heard the familiar sound, followed by the wind as the air was displaced by the materialising blue box. "Let me come, too," Mickey said. "I want to help." "You have responsibilities here." He looked meaningfully at the baby seat. "You stay here where you belong and take care of Mickey the Idiot's responsibilities. And when it's all sorted… we'll be back to see if Jackie's cooking has improved at all since we were here last." He touched Mickey firmly on the shoulder and a look passed between them as between men with equal burdens to carry. Then he took Rose by the hand into the TARDIS. "Where ARE we going?" Rose asked as he powered up the Time generator. "Or rather WHEN?" "Why? What or who is there in 1912 that has anything to do with my mum and millions of other people dying in 2012?" "The great grandparents of Letitia Daniels, the scientist who found the anti-serum to treat infectious cancer and inoculate the population against it BEFORE it became airborne. I met them once before. A very nice family. They never realised what I did for them." "What did you do for them?" "I stole Mr. Daniels' wallet." "Oh. Right. Sure. That makes sense. You're a time dimensional pickpocket." "One of my many talents." He looked at her. She had stopped crying since they boarded the TARDIS. "I know this makes no sense," he said. "But you DO believe I can make things right?" "Yes. You always make things right. But… somehow…. HERE in the TARDIS, we're not in any time and space, right. So what happened before… hasn't happened. So there's no need to worry. Right…." "Right." He smiled. "Glad you're keeping your spirits up." He flipped some switches and incomprehensible things pinged and beeped and whined. "By the way," he said, "I WAS joking." "What?" Rose looked at him. "Joking about what?" "It wasn't Burnley that won the Premiership five times in a row. It was Preston North End." Rose looked at him for a moment and then burst into tears. He went on with his work quietly. "Humans," he said under his breath. "When they say they don't need to cry, somehow, they always DO." The TARDIS's time circuits indicated an earth date of April 10th, 1912. Presently The Doctor and Rose emerged, dressed in suitable period costume, The Doctor actually looked like an Edwardian doctor in a suit with high collar and top hat. Rose looked, in The Doctor's favourite catchphrase, fantastic, in an ankle length red silk dress with a wide brimmed hat covered in flowers and fruit and a deep burgundy cloak to keep her warm in the sea breeze. He took her by the arm as they moved towards the large crowd gathered by the berth of a big ocean liner. History was never Rose's strong point, but movies were, and something started to look familiar as they came closer. "That's…. it's… oh my…. Oh…Oooh." "The Titanic," The Doctor said, his eyes shining despite what he knew even more certainly than Rose did. "Fan…tastic." "Yes. It is…. But…." As they watched, the great ship's horn sounded and a cheer went up from the crowd. It began to move, slowly at first, as ocean liners do, then a little faster. The crowd cheered loudly and they could see people on board, on all of the decks, cheering back. The Titanic had sailed on its first and only voyage. "This is for you, Doctor…." They turned as a voice spoke nearby. A scruffy looking street urchin half The Doctor's height thrust a note into his hand and ran off. He started to give chase but realised it was too late. The urchin had already disappeared into the crowd. He opened the note and read it quickly. Dear Doctor, thank you for your assistance yesterday when my wallet was stolen with all our money and tickets for the journey. You will be glad to know that, after you left us at the hotel, the wallet was handed in by an honest person who asked for no reward and did not leave his name. We are boarding the ship shortly. Bless you for your kind help and assistance. The Doctor turned to see the Titanic already steaming out to sea, the crowds beginning to break up now that it was no longer possible to see loved ones on board. "DAMN!" He said. And Rose, who rarely heard him swear even when not in period costume, was startled. "Come on…." he said. And he turned around and led Rose straight back to the TARDIS without even a backward glance or a thought to how strange it looked as they walked into the small blue box. "What is going on?" Rose asked as The Doctor walked straight across the control room and opened a door she had never even noticed before to reveal a room lined with filing cabinets. "What's this place?" she asked. "The TARDIS's printed material archive. For documents and photographs that don't fit in an electronic database." He obviously knew his way around the archive for he went straight to one particular drawer and opened it. "Yes. No ticket, no money, no Titanic." "We have a Time Meddler." "There aren't many left now. The Time Lords cracked down on most of them. But a few slipped through. They're a sort of time dimensional gremlin. They mess things about for the fun of it. They make small adjustments to the time continuum that switch alternate universes from one track to another. In the original reality, the Daniels' DID miss the boat through losing their tickets. They travelled on another boat two weeks later and lived a good life in the USA. Their great granddaughter, Letitia Daniels, became a famous immuno-biologist who won the Nobel prize for medicine after finding the cure for infectious cancer. And WE popped in to Jackie's for a thoroughly inedible dinner. THEN, the time meddler messed things up. The tickets didn't get lost. Mr. Daniels dropped his wallet on Southampton railway station, but the meddler slipped it back into his pocket. Reverse pick-pocket. I had to steal them again and pretend I was helping the Daniels' by finding them a hotel to stay in while they sorted themselves out. That's when that picture was taken. The day AFTER the Titanic sailed. But the meddler has done it again. He must have pick-pocketed ME. And now the ship has sailed and the Daniels' ARE on board. They never should have been. One way or another, they should have missed the boat. "So why can't we just go back a few hours and pick-pocket them again?" "Those horrible things - the time reapers - taking people away until nobody is left and the earth just dies." "And if we don't alter the time line…." "One fifth of the world population dies of an unstoppable disease in 2012/13 - including your mum, Mickey, and Mickey's girlfriend and son." "Mickey's…. not Linda Watson from Cable End?" "No. No it doesn't. Because you're going to sort it out, and none of them will die." "He'll still be 'shacked up' with Linda Watson." "I know. But he'll be alive." "Ok. Well, enough chin-wagging. We have to get on. First things first." The Doctor moved around the console to a large covered panel. He lifted it and pressed the button inside. There was a deafening whistle and then silence, and then, "Goddamn it, Doctor you sure know how to cramp my style…. I was pulling two birds with one Jack in 18th century Italy." "Jack!" Rose ran to embrace the space lothario who had been summoned by the TARDIS's inter-dimensional recall button. The Doctor looked at the way he hugged her with ill-disguised jealousy. Jack was closer to her age and was a lot better at being affectionate in the way girls liked. Well, he'd had a LOT more practice after all. It was easy for him. "Holidays are over," The Doctor said, cutting into their reunion. "We have problems to sort out. I need you to sweep Southampton for a time meddler. Your gadgets will easily spot anything non-contemporary, and you know how to neutralise them." "A ten second burst of gamma radiation to the head destroys their ability to transport. If they try their heads explode." "Serves them right, they're the scourge of the universe," Jack said. "They ought to be rounded up and exterminated." "Ah, now," The Doctor said. "That's a bit too much. It's not as if they even mean any harm by it. It's like a hobby of theirs - transplanting time lines. Like some people do topiary or bonsai trees. Rounded up and made to live in late 20th century Milton Keynes is punishment enough." "A fate worse than death," Jack said with a grin. He kissed Rose on the cheek and checked his 'gadgets' before The Doctor opened up the TARDIS door on 1912 Southampton again. "Rose…" he said. "Maybe you should stay here with Jack. What I need to do next is dangerous." "Ok, get going. Enough chin-wagging. And you keep your mind on the job and off Edwardian women." Jack waved heartily as he stepped outside the TARDIS. The doors closed and The Doctor pressed buttons and wound dials in preparation for a dematerialisation. "We have to catch up with a ship that's about to meet a large iceberg and make sure the Daniels family get on board the lifeboats. The primary danger is actually getting the TARDIS to land on the ship and not in the sea or slap bang on top of the iceberg." "Can the Tardis float?" Rose asked. "I've never tried to find out," The Doctor said. "And I don't intend today to be the day. So hush a minute while I make the calculations." "Why do we have to get them into the lifeboat? Why don't we just get them into the TARDIS and whisk them away?" "Timelines are delicate things. If I take anyone from this time away from it for even a few minutes it could upset the balance and the Reapers will be back. I have to let nature take its course as far as it goes. The Titanic HAS to sink but six people who should not have been on it anyway can be got onto the lifeboats and survive and then this timeline will be exactly the same as the original one. Letitia Daniels will be born in the USA and grow up to be a famous immuno-biologist." "Ok… so HOW do we find them?" "It's always the awkward questions with you, isn't it." The Doctor looked at his instrument panel and made a final turn of a knob. "There. I've got the first part of the plan right." 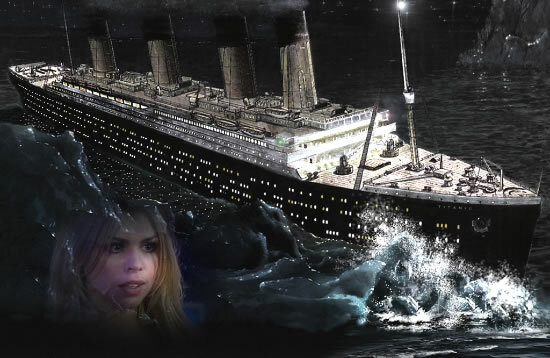 As he hit the door control Rose turned, half prepared for icy water to rush through the TARDIS. What she did get, as soon as the atmosphere inside and out were equalised, was the realisation that the TARDIS was at sea. She stepped out onto the bow end of the upper promenade deck of the Titanic. An electric lamp made the deck as bright as day even though it was pitch dark beyond the rail and nothing could be seen but a few dim stars in a misty night sky. Instinctively, she walked towards the very front, where the railings came together in a point. The wind blew her blonde hair backwards. The Doctor came up behind her as she hoped he would and she smiled a secret smile. She closed her eyes and put out her arms either side. "It IS like flying," she said triumphantly after a few minutes. She wondered if The Doctor had seen the film. "Time to find the captain and warn him…." Rose suggested. "No. We can't, can we. He wouldn't believe us anyway, I guess. And it would be changing things - Reaper time." "The Daniels family, nobody else." The Doctor said emphatically. "It will be easier if you don't interact with too many people." He could see the words 'why not' forming on her lips. "Because if you don't know them, you can't care for them, and you can't mourn them. There are 2,214 people on this ship - including us. 705 will live. The rest will die. We can't change that. We mustn't. And it is far easier if all they are is numbers. Take it from me. I know about these things." Then he took her by the arm and sauntered sternwards. "What were you doing up there at the sharp end anyway?" "Oh, nothing," she said with a blush. I guess he doesn't watch movies, she added to herself. It was like being IN a movie, Rose thought as they walked nonchalantly among the passengers strolling on the top deck of the Titanic in the cool evening. Dinner was over and there was dancing in the ballroom. The music drifted through the windows. Couples in elegant dinner suits and dresses covered by overcoats were walking, or smooching in what they thought were quiet corners. "If they knew…" Rose said quietly. "If they knew… would they do anything different?" "Is there a better way to spend your last hours than with somebody you love?" That was an odd philosophy from The Doctor. Love was not something he had ever talked about. She wasn't entirely sure he knew the concept. Friendship, loyalty, mutual trust, yes. But love… "Anyway, these are first class. Most of them will be saved." "Oh… we're travelling first class then?" Rose asked. "It looks like it. Trust the TARDIS to set us nicely." "Er… What about the Daniels family? Were THEY first class?" "No, second, The Doctor said. "Ah… good point." He headed towards the stairs leading to the deck below the one they were on. A gate was across it and a sign indicating that it was the way to the second class deck. It was locked and bolted. The Doctor pulled out his sonic screwdriver and adjusted it and a moment later the lock had melted. "They're going to need access gates open soon anyway," he said. "The lifeboats are all on this deck." They were at the bottom of the steps when The Doctor paused. He looked at his watch and grasped Rose firmly by the shoulders with one arm while he grabbed at the stair rail with the other. "This is it," he said. Suddenly, the boat shuddered violently and the air was filled with an eerie sound that, to Rose, sounded for a moment like the TARDIS de-materialising - a tortured sound of metal ripping and grinding and being bent out of shape by a powerful force. The Doctor pulled Rose right under the metal stairway, backs against the bulkhead. They both watched in shocked awe as the iceberg slid alongside them. They were almost close enough to reach out and touch it. Rose thought she could feel in her feet the ship's hull being ripped to pieces below sea level. Huge, dangerous chunks of ice were sliced off the berg and crashed down onto the deck. Some very close to them. If The Doctor had not known exactly what was going to happen, they could have been caught in it. It seemed to go on for ages. But then as suddenly as it began it was over. The engines were still running. The ship was still moving, and ice was still falling, but the worst was over. "Come on," The Doctor said. "We still have to find the Daniels family." They half ran, half skidded along the ice-strewn deck and reached the entrance to the lounge safely. To Rose's amazement there was almost no indication that there was a problem inside. A steward was clearing up spilt drinks while another was pouring fresh ones. A bridge party continued unabated. "This ship is going to sink in two hours," The Doctor shouted to them. "Don't just sit there. Get into lifejackets at least." The buzz of conversation stopped for a moment. People looked around at The Doctor then carried on talking, some laughing a little nervously, and Rose caught a drift of chat - "mental… unsinkable ship…. Lifejackets indeed…"
"You…" He caught hold of a Steward who was carrying empty glasses to the bar. "I need to find the Daniels family. Do you know where they are?" He flashed what Rose recognised as the psychic paper. It seemed to tell the steward that he was some kind of private detective. "Come this way, sir," he said. And The Doctor and Rose followed him to the second class cabin corridor. "That'll do," The Doctor said. "You can go serve drinks now. While you can. But put on a lifejacket first." The steward hurried away. The Doctor banged on the door of the cabin. Mr Daniels answered the door. He was in his nightgown. "Doctor?" He exclaimed in surprise as he recognised him. "I didn't know you were on board." "Never mind that now," The Doctor said. "You all have to get dressed and come with me." "What? But… I don't understand." "Didn't you hear the crash? This ship is going to sink." "But this ship can't….." The Doctor made an exasperated sound. "The next person to tell me that is going to get left on board when it goes down." Then he looked hard at Mr. Daniels and repeated emphatically. "Get dressed and come with me. Do exactly as I say." Rose wondered if he was hypnotising them. Maybe he was, because there was no further argument. Minutes later the Daniels family were dressed and waiting for his next command. Mrs Daniels looked frightened, the baby was crying, the little boy looked tired and fretful, and the three girls wide eyed with wonder at what was happening, but they obeyed The Doctor when he told them to come on and hurry. He brought them to the end of the corridor where there was a cupboard marked 'life jackets.' He used the sonic screwdriver to break into it and handed them out to the family. "You, too, Rose," he said, giving one to her. "And you," she told him. "You're not indestructible." “I’ve managed so far.” But he took the jacket she held out to him and put it on. In the Edwardian clothes, with a life jacket over them, he looked even less like the man she had come to know in the leather jacket and sweater. But he was still the one she trusted implicitly. “Come on,” he said, striding down the corridor. She followed. So did the Daniels family. Whatever he was wearing that unmistakeable and elusive quality called authority exuded from him. People did what he told them. Their route took them back through the lounge. The Steward protested. "Sir, what are you doing? Everyone should stay where they are until the slight problem is resolved." "Slight problem?" The Doctor turned the full force of his stare on the man. "Get out of my way," he said very firmly but calmly. "Put on a lifejacket and be ready to save yourself. But get out of my way." In the momentary silence while the Steward seemed to debate his options a woman sitting nearby gave a shrill squeal. Rose looked around and saw the drinks on her table all suddenly slide down into her lap. The ship had tilted very obviously towards the front end. "ALL of you, put on lifejackets," The Doctor shouted, turning around and addressing them again. "Some of you might live if you do." Then he pushed the Steward aside and ushered the bewildered Daniels family out onto the deck. He half led, half pushed them to the stairway to the top deck. "Keep going," he said. "Up the stairs." Rose took the rear of the party. As she came through the gate at the top of the stairway she was aware of angry voices. "Second class are not allowed up here," a tuxedoed man shouted. "Get back down those stairs." The Doctor ignored the man and led the Daniels family to the lifeboat station. He pulled back the tarpaulin and lifted the youngest Daniels child into the boat, then the others. "Get in," he told the parents. "Lie quiet. When they START loading the boats they will be in such a panic they won't notice that you're already aboard." Then he turned to Rose. "You get in there, too." "Stay with the Daniels family," he said. "I'll see you on the Carpathia." And he lifted her into his arms and put her onto the lifeboat. He tied the tarpaulin back down. As he did so there was a shout. The tuxedoed man had returned with a uniformed White Star Line officer, who pulled a pistol and ordered The Doctor to raise his hands. "Where did the others go?" He was asked. "They went back down to second class like you said," he replied. "I was just going to take this dingy out for a sail." "You're a stowaway, aren't you," the tuxedoed man said. "Arrest him at once." "I'll come quietly," The Doctor said, moving away from the lifeboat. "But let's get this sorted quickly. This ship is going to sink in an hour." "Ridiculous," the tuxedoed man said. "I designed this ship. It's unsinkable." The Doctor laughed. "You know, every time you said that in the films I thought it was ridiculous. I can't believe you REALLY said it." "Mad!" The tuxedoed man stomped away. The officer sighed. "I don't know what this is about, but you'd better come with me, sir. I'll have to put you in custody until we find out who you really are." "I'm the man telling you that this ship is going to sink in an hour and anyone still on board will be dead," The Doctor said. As he spoke, there was a sound of the ships horn and the words "abandon ship" began to be heard up and down the decks. Sailors appeared from the crew areas and began to operate the rigging that swung the lifeboats out ready for loading. As The Doctor was led away, he saw the one with Rose and the Daniels family aboard put into action. Meanwhile a crowd was beginning to form around it. Soon they would be among the first people lowered down to the relative safety of the icy waters of the Atlantic. He was relieved. "Sit down there," he was told as he was brought into an office. The floor was now at a steep incline and when he went to sit the chair was at an angle. "Turn out your pockets,"
He did so. The sonic screwdriver, the TARDIS key, a packet of toothfloss and a yoyo were the sum of his possessions. He laid them on the table. They rolled along to the other end. Just then the door banged open and a junior officer requested his captor's presence elsewhere. "The captain says to issue side arms to all officers," the junior said. "Very well," the officer replied. "You will remain here," he told The Doctor and to be sure he was handcuffed to the table. As the door closed The Doctor sighed. "Fantastic," he said. "I'm going down with the ship." He tried to reach the sonic screwdriver, but it was just out of reach. And as the tilt of the ship increased it rolled another inch away from him. Even a Time Lord was out of options chained to a desk at the bottom of the Atlantic ocean. He felt a real sense of fear for one of the few times in his life, and thought how ironic it was that he had survived Dalek attacks and Time Wars, genocides and planet-wide destruction, but was doomed to die on earth in the middle of the ocean and the only monster was an inanimate block of ice. The door opened. "Typical," Rose said as she sauntered in. "I leave you for five minutes and you're in trouble." "Get the Sonic screwdriver," he said. "Set it for C-5. And aim it carefully. I want it to melt the handcuffs, not my hands." "I was good at metalwork," she said as she did as he asked. "But my mum thought domestic science was more suitable for a girl and made me drop it." The handcuffs dropped apart. He was free. He took the screwdriver from her and gathered up his other possessions. "Why are you here," he said. "Why aren't you on the lifeboat?" "There's gratitude. I rescued you. Don't worry. The Daniels' are safe. I got out of the boat on the second class deck and came back to get you. The lifeboat carried on down. They're well away by now." "Good," The Doctor said. "That's that sorted. Let's get to the TARDIS and get away from here." "Er… one problem," Rose said as they emerged onto the now steeply tilted deck. She pointed downhill. "The TARDIS is down there. And you said you didn't know if it floats or not." "DAMN!" He said, the second time she had heard him swear. He pressed the key but nothing happened. "Something is blocking it. The angle of the ship, maybe. Come on… we're going to have to get off this boat the old-fashioned way." He ran with her up the incline to where the last of the lifeboats was being filled. As they reached the rail the boat began to descend. The doctor looked and saw it was only partly filled. The sailors, desperate to get the boat launched, had sent it down too quickly. "See you on the Carpathia," The Doctor said, and he lifted Rose into his arms before she could protest and with a shout down to the sailor in the lifeboat to "Catch" he threw her overboard. He looked down to see her scrambling to her feet on board the rapidly descending lifeboat, looking ruffled and angry and also scared. He heard her scream to him, "Doctor!" The last lifeboat was gone. 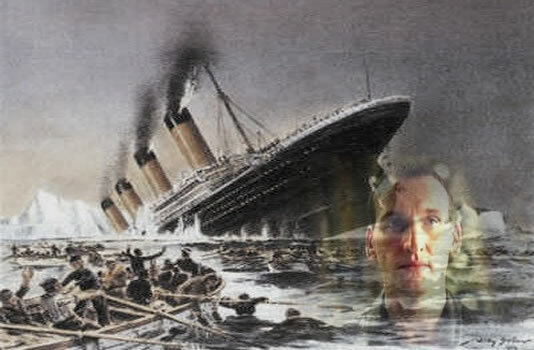 Now panic engulfed the Titanic. People began running as fast as they could to the back of the boat - which was quickly becoming the TOP as the front - where the TARDIS was - sank down further and the stern raised out of the water. Running out of time, The Doctor thought as he clung to the rail and pressed the TARDIS key again and again. Still nothing. Was it already under water? Falling to the bottom of the ocean? WAS it watertight? So many centuries travelling in it and that was probably the one thing he didn’t know about it. One thing he did know, was that anyone left on board this ship when it went down would be dead, dragged down with it. The alternative was to jump into icy seas that would kill most human beings as soon as they touched it, just from the shock. But The Doctor was not human. His two hearts meant that his blood was faster and contained more oxygen than human blood. He had a better chance. He stowed the TARDIS key and the sonic screwdriver safely in his pocket and jumped. There was time to take a gulp of air as he plummeted and then he hit the water. Even for a Time Lord with two hearts and superior strength and stamina it hurt. The water felt like a solid wall that he had smashed through. Every bone in his body felt bruised. His one breath was barely enough as he sank down into the icy cold water and then, through natural buoyancy, began to rise up again. He kicked off his heavy leather shoes to help his ascent. As his head came up out of the water he was able to breathe, but only just. It WAS freezing. The water was freezing, the air above it was freezing. His lungs burned as he gasped for breath. But his brain was clear and he knew he had to swim for it. He plunged forward and pushed himself through the water in a fast, if ungainly crawl. He clawed at the choking Edwardian collar and tie and threw it aside, and he kept swimming with all his strength through the dark, freezing water, in total darkness, not knowing where he was headed except that it was away from the stricken ship. He swam for ten minutes or maybe fifteen - it seemed longer as every stroke became harder to make and he wondered if being a Time Lord just meant that he would die more slowly and painfully than humans. Then he felt, rather than heard, the cries of the last souls aboard the Titanic as it slid beneath the waves. He almost cried out in horror as he felt their last moments - all of them at once - etch themselves into his own soul. It was a feeling he had known before. He had seen whole worlds die in an instant - one of them his own homeworld - and felt a billion souls cry out at once. But the mere 1,523 souls that cried out now hurt no less and cut no less deeply into the very core of him. He did what he always did in those terrible moments. He fixed his mind on one soul, one that he knew would, at that moment, be fixing on him. "Rose," he called out with all his strength. "I'm here. I'll find you. I don't know how… but I'll find you." Then, in the sudden silence that followed, he became aware of something. Treading water, he reached into his pocket and pulled out the Tardis key. The glow from it was like a beacon in the pitch darkness. He pressed it and heard, all around it seemed, coming out of the ocean itself, the sound of the TARDIS re-materialising. He watched it rise up out of the icy water, a Titanic White Star Line lifebelt caught up by its trailing ropes on the lintel above the door. He swam towards it, thanking whatever fates had dislodged his time ship from the ocean bed just as the ill-fated liner had gone down to join it. He dragged himself up on the doorstep and clinging on with one hand he inserted the key in the lock. He almost fell in through those doors that the massed hordes of Khengis Khan could not break through. Neither, he was pleased to find, could the Atlantic ocean. On board the Carpathia, the officers were trying to compile a list of the survivors. "Miss…." The officer with a clipboard turned to Rose as she looked out to sea, looking for… she wasn't sure what. The TARDIS was not THAT sort of ship, after all, and anyway, it had sunk with the Titanic. "Miss... can you tell me your name and your berth number." "Rose Tyler," she told him. "But I didn't have a berth. I… I was a stowaway." "I beg your pardon?" The officer blinked in surprise. "Did you say…"
"You could throw me back I suppose," she suggested. Then she turned and smiled. But not at the bewildered officer. She saw the Cunard Line's flag suddenly flutter in the opposite direction momentarily and caught a glimpse of something blue that had no business being there. She had to push her way through the crowds of Titanic survivors and curious Carpathia passengers to reach the one clear space on the deck big enough for a materialisation. The TARDIS door opened as she reached it. The Doctor, dressed in his old green jersey and leather jacket leaned on the doorframe and smiled at her in that way of his. "I told you I'd meet you on the Carpathia," he said. "Are the Daniels family all safe?" "Oh yes," she said. "I saw them this morning when they gave us all breakfast. They're shocked, like anyone else. But they're alive and well." "So…" As she stepped into the TARDIS she had a million questions. The first one was probably the least important. "Why didn't the TARDIS respond at first?" "It doesn't like being upside down," The Doctor said. "When it went down with the ship it was upside down. Then it loosened itself and turned right way up and I was able to summon it." "Me? Drowned? Not a chance." Well, maybe a chance, he thought. But he wasn't going to tell her. His experience in the water last night was one of many things he would never share with her, no matter what else he might confide. "Well, we'd better go collect Jack. He must be tired of keeping a time meddler company by now." "What does a time meddler look like, then?" Rose asked. Her question was answered within a very short time. The TARDIS re-materialised back on Southampton dock. Jack was sitting on a bench next to a very disgruntled looking, sallow faced, very thin boy of about eight years of age, wearing a sonic handcuff that kept him to within ten feet of Jack at pain of instant electrocution. "One Time Meddler who will meddle no more," Jack said. "It's just a boy," Rose said. It was the same urchin who had given The Doctor the note as the Titanic sailed. "Gee, that's an offer hard to refuse…" Jack said. "But… on the whole… I've unfinished business in 18th century Italy. You two could skip tea and join me…." "No," The Doctor insisted. "Tea at Jackie's it is as soon as we've dropped you off." "Everything WILL be all right, won't it?" Rose asked as they walked up towards the tower blocks. Everything LOOKED right, she thought. But then it had last time, too. "Yes, I told you. We've reset the timeline. Letitia Daniels found the cure for infectious cancer two years ago. A massive immunisation programme prevented the epidemic and the airborne variety never took hold. And Preston North End are STILL five times champions of the Premiership." "That I DON'T believe," Rose said. As they turned the corner, her heart sank. There was an ambulance there, just like before. But there were no police, she realised. No masks, and as she reached the door she saw the paramedics bring out Mrs Bryan, the old lady who owned all the cats in the neighbourhood. She had fallen over one of the cats and broken her leg. "And the damned lift isn't working," she heard one of the paramedics complain. But Rose didn't care about that as she tore up the stairwell. The Doctor followed on behind, noting ruefully that two hearts and a superior physique didn’t stand a chance against a teenager who was glad to be home. He reached the landing just in time to see Jackie and Rose hugging as if they hadn't seen each other for - well, seven years. Jackie saw him and told him it was lasagne, like it or lump it. "Lucky for you I made plenty. Mickey and Linda are coming up, too, with the baby." "Lasagne sounds Fantastic to me," he said. "And put the telly on. Preston North End are playing Burnley for the Premiership title this afternoon."